Bill Rosene, a Buckeye, Arizona-based agent, recently jumped into real estate with the hope of providing more for his family than he could as a math teacher. But he remained deeply concerned about the challenge of getting by on a public school teacher’s salary in Arizona. So when he learned of the groundswell of unrest among Arizona educators that culminated in a strike last month, he threw his support behind the movement, known as #RedForEd. Joined by colleagues at his brokerage, Keller Williams Realty Professional Partners, Rosene has leveraged his business network and background to support the grass-roots campaign, such as by mobilizing notaries needed to advance a ballot initiative. His activism shows that real estate agents, with their independence and frequent desire to participate in community life, are often uniquely positioned to advance causes close to their hearts — and improve their business prospects in the process. #RedForEd erupted out of long-simmering teacher discontent over Great Recession-era cuts to Arizona public education that have diminished school resources, crowded classrooms and put downward pressure on teacher pay — which reportedly ranks 49th in the country. The movement culminated in a recent six-day walkout that yielded a partial victory for teachers, marking one of the most recent conflagrations in a wildfire of teacher revolts that have engulfed various states. 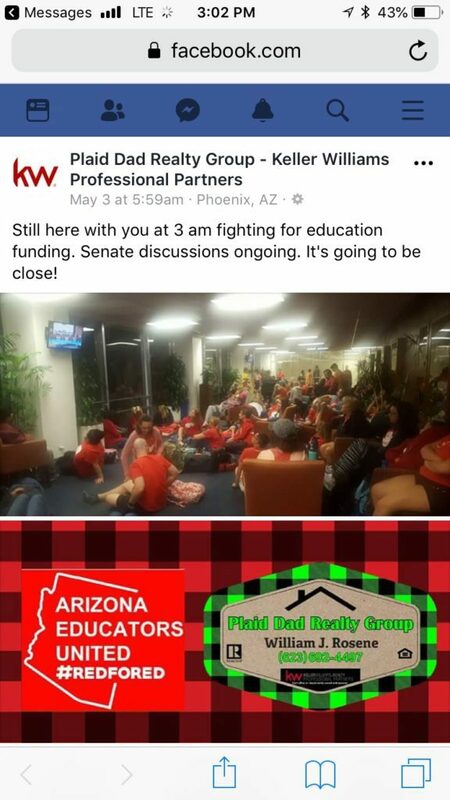 Rosene, who owns “Plaid Dad Realty Group,” helping spearhead #RedForEd’s continued drive for more school funding, picking up business and community standing along the way. The agent started by pounding the pavement, talking dozens of businesses in his community into hanging #RedForEd signs their windows, he said. One morning, he bought coffee and donuts and handed them out at rallies with colleagues, hopscotching to “walk-ins” at three different schools, in which teachers congregated before school and entered their workplaces in a sea of red. He also orchestrated a “stand-out,” where protesters rallied along stretches of road to make their demands known. To help organize the event, Rosene wrangled local contacts for the Arizona teachers union into a Facebook group where they could exchange updates and coordinate activities, he said. In other Facebook groups and chats, he helped coach educators and others on how to respond to common objections to a strike, including making it clear #RedForEd was intended to secure the resources for students and better education, not bigger paychecks for teachers. He also participated in a rally at the Arizona State Capital that drew thousands. The event was followed a month later by a six-day strike in late April. The walkout ended after Gov. Doug Ducey signed off on a 20 percent raise for teachers and $100 million in capital funding for schools. But #RedforEd’s work isn’t finished, Rosene said. To achieve the movement’s original goal, activists must gather more than 150,000 signatures to put a proposal on the 2018 ballot that would restore the state’s decade-long $1 billion funding shortfall. The signatures must be notarized. So to help, Rosene tapped his favorite title officer to turn out more than a dozen notaries to certify signatures that will be collected during canvassing for the ballot initiative. Catherine Barrett, one of a number of architects of #RedForEd, said she told Rosene he could wear a name tag and distribute business cards at some future campaign events, including a statewide canvassing Saturday, May 26, staffed with notaries recruited by Rosene. Rosene also plans to offer a $250 credit out of his real estate commission to future clients that will go to a school of a client’s choosing. Agents can alienate some customers by pushing their politics, but activism can also enhance their appeal to others. Rosene is already working with a referral from a woman he met when distributing snacks during a rally, and he’s talking to prospective clients that he connected with at rallies and through Facebook. But backing #RedForEd was never about money, he said. Barrett, the #RedForEd organizer, wants to work with Rosene the next time she moves, and she plans on recommending him to friends and colleagues. Other Realtors who choose to lend a helping hand to #RedForEd might also receive referrals from grateful educators, she noted. But no other agents have reached out to her so far. “Maybe if they knew, they would,” she said.